I'm back. Feeling rested and relaxed. The sun even shone in Maine for much of the time, so my mosquito bites blend with my mild tan. Open Call: "America's Biggest A**Hole"
Bring a photo and bio. Boston Landmarks Orchestra, "Intensely Italian"
Free orchestral music on the Esplanade isn't over, it's just beginning. The Boston Landmarks Orchestra is performing at the Hatch Shell on Wednesdays -- as well as other concerts -- through September. - Giuseppe Verdi, "Overture to La Forza del Destino"
- Felix Mendelssohn, "Symphony No. 4 in A major, Op. 90"
- Giuseppe Domenico Scarlatti & Vincenzo Tommasini, "The Good-Humored Ladies"
- Peter Ilyich Tchaikovsky, "Capriccio Italien, Op. 92"
Hey, it's going to be nice night to be outside. It's tough to gauge whether this is a chance to see one of the stand-out films of the year before your friends and family. Or it may be a cutesy, overly clever hipster mockumentary about love. It might even be both. The premise is that actress Charlyne Yi doesn't believe in love and decides to interview friends and strangers about how people fall in love when... she interviews dork superstar Michael Cera. There's chemistry, and their relationship becomes integral to the "documentary". It's actually a scripted film, and the actors seem to be dating in real life. Charlyne Yi and Jake Johnson (who plays "Nick", the director) will appear for a Q&A session. The New York Songwriters Circle started a couple decades ago as a regular gathering at NYC's Bitter End, and they started a competition about 5 years ago. As much as we can hate their baseball teams, New York is a place where good musicians often go to find "success". Tonight isn't a part of the contest, but the wonderful Mieka Pauley won the grand prize competition last year -- so even if it's rigged in some way, they have good taste! Almost all of the other performers are Songwriters Circle contest finalists in the past couple years. Several of tonight's performers are former or current Boston residents, and almost all of the other performers are Songwriters Circle contest finalists in the past couple years. All of these singer-songwriters have got seriously good songs and chops. I liked that Caleb Hawley has already written a song about Michael Jackson's death (comparing him to Elvis). Will Knox and Liz Longley sound really good. 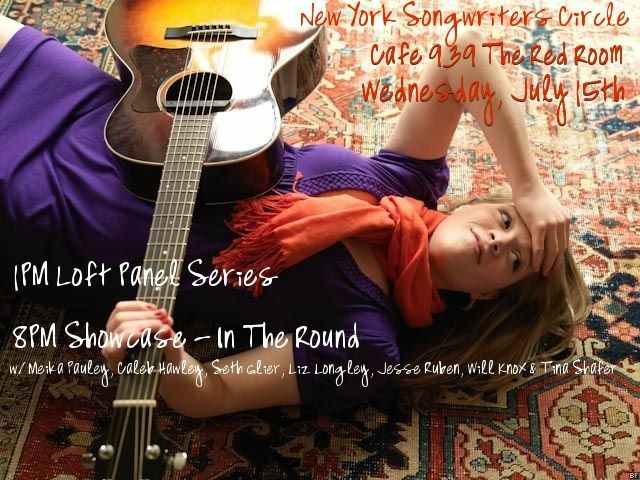 Each will probably perform a few songs in the round, which is hosted by Tina Shafer artistic director of the NYSC. FYI: This is a great room to hear music.